The tiny mustard seed of the Bible has another claim to fame. It is a gloriously fragrant spice that inspires memories of mother’s cooking. The colours range from yellowish white to black and they are normally 1 to 2 mm in diameter. Used in many an Indian dish, it comes from the mustard plant. Three types in particular: black mustard (Brassica nigra), white mustard (Brassica alba) and brown mustard (Brassica juncea). White mustard is the mildest and is used to make American mustard, while black mustard is the most pungent of the three. Mustard seeds grow well in temperate climates and are found in India, China, Great Britain, United States, Canada and Hungary. Mustard powder and seeds can be preserved in tight containers in a cool, dark and dry place. Besides being a condiment it is also used for medicinal purposes and has numerous health benefits. 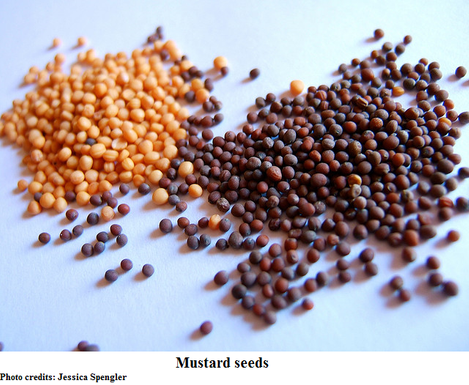 Mustard seeds contain phytonutrients which are natural plant compounds. These phytonutrients have the ability to protect one from cancer of the gastrointestinal tract and perhaps slow down the progress of cancer too. Consumed on a regular basis, mustard seeds can keep away and control cold, chest congestion and symptoms of asthma because of their anti-inflammatory property derived from the presence of selenium and magnesium. Selenium in mustard seeds can boost a sluggish thyroid. Mustard seeds are rich in B-complex vitamins that can help speed up your metabolism. Mustard oil has all the necessary components to stimulate hair growth. The antioxidant properties of mustard seeds help slow down aging. Anti-inflammatory properties and the ability to produce heat make mustard seeds a good remedy to ease rheumatoid arthritis and muscle pain. You can make a paste of mustard seeds and apply it or put them in a small cloth bag and allow it to soak in warm bath water. The content of sulphur in mustard seeds makes it anti-bacterial and helps soothe skin infections. Omega-3 fatty acids in mustard seeds enable them to help in the process of building cell membranes in the brain. Mustard seeds have niacin which lowers cholesterol and prevents atherosclerosis. The multitude of nutrients present in the seeds build up the immune system. Ingredients: 1 cup of chopped pumpkin, 1/2 cup of chopped papaya, ½ cup chopped beans, 1 cup of chopped potatoes, ½ cup of chopped carrots, 10-15 medium cauliflower florets, ½ cup of chopped tomatoes, ½ cup of chopped beetroots, 2 tbsps of groundnuts, 2 tbsps of green peas, 1 cup of coconut paste, 1 tsp of coriander seeds, 2 pinches of asafoetida, 2 pinches of mustard seeds and ¼ tsp of turmeric powder. Preparation: Cook all the vegetables together and keep aside. Grind the cup of coconut paste, coriander and chillies together. Heat oil in a non-stick deep frying pan. When it is hot, add the mustard seeds, asafoetida and turmeric powder. Put in the cooked vegetables, coconut paste preparation. Add a little water, and salt and sugar according to taste. Cook for 5-10 minutes. Ingredients: 1 finely chopped medium sized cabbage, 1 tbsp of sunflower or coconut oil, 2-3 pinches of mustard seeds, ¼ tsp of turmeric powder, 2 pinches of asafoetida, ½ cup of grated coconut, 1-2 green chillies (optional), sugar and salt. Preparation: Heat the oil in a deep frying pan. When it is hot add mustard seeds, turmeric powder, asafoetida and chopped green chillies. Add finely cut cabbage and fry it for 3-4 minutes. Add sugar and salt according to taste. Also add ¼ cup of water and cook it till water disappears. Garnish the dish with grated coconut. High Blood Pressure: Mix 1 tsp of cumin seed powder in 2 tsps of coconut water and 2 tsps of milk. Drink the mixture every morning for 15 days to help stabilise blood pressure. Continue if required.